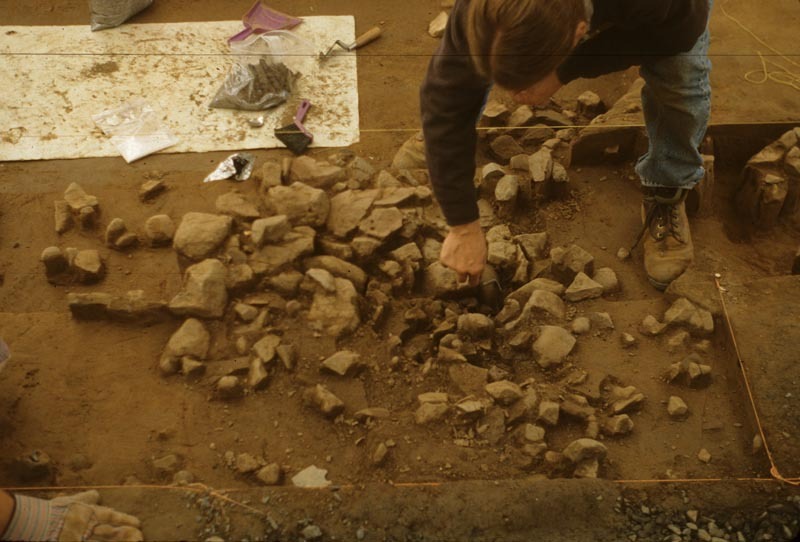 The Section of Archaeology has highlighted the excavations at Fort Hunter on many occasions, but Fort Hunter was only one link in a chain of French and Indian War-era blockhouses, forts, and stockades located along the frontier of Pennsylvania. 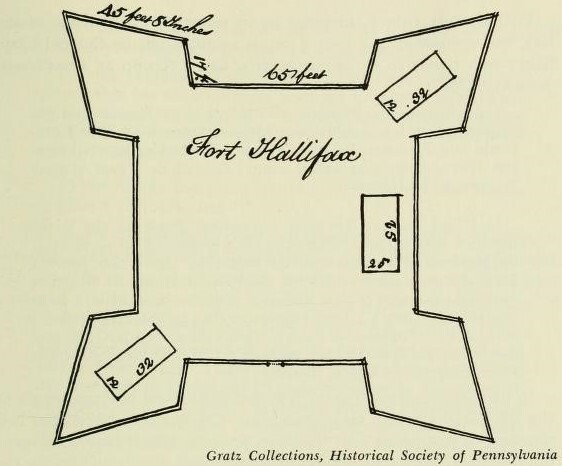 Another one of these forts was Fort Halifax, located approximately 18 miles north of downtown Harrisburg along the Susquehanna River. Along with Fort Hunter, Fort Halifax served as a stopping point and supply depot for Fort Augusta, located in Sunbury another 35 miles upriver. Excavations and searches for evidence of Fort Halifax over the last few years have led to a better understanding of its role in the defense of Pennsylvania’s frontiers during the war. The land upon which Fort Halifax would be built was settled in the early 1750s by Irish immigrant brothers Robert and Alexander Armstrong. The Armstrong’s warranted 100 acres of land at the mouth of a small run that would come to be known as Armstrong’s Creek and here they set up a farm and saw mill. Robert and Alexander were among the first residents of this area and no roads yet existed to their farm; instead the river provided the main means of transportation. 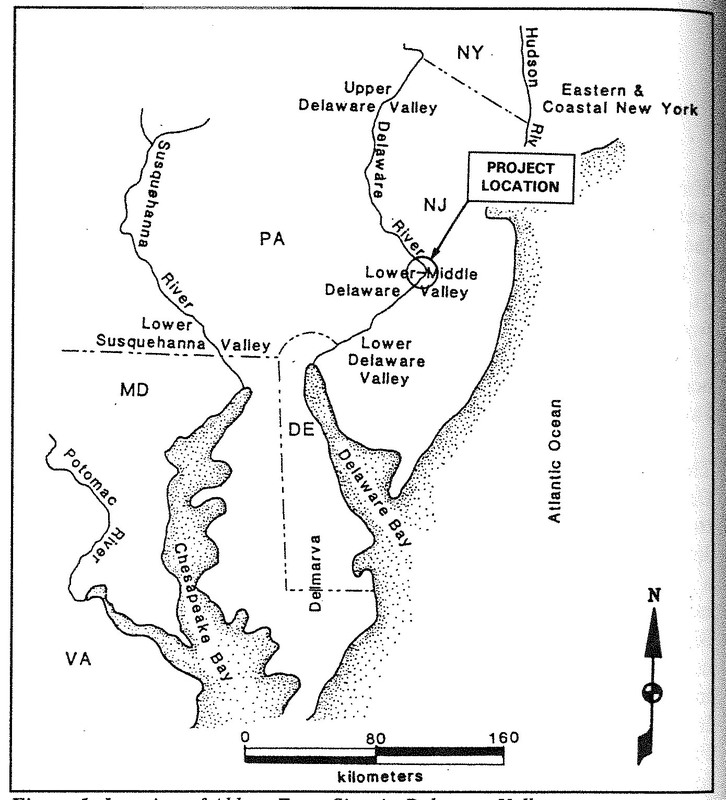 In October of 1755, the massacre of settlers at Penns Creek on the west bank of the Susquehanna River, just below what is now Selinsgrove, sent the inhabitants of the frontier rushing back to Lancaster, Philadelphia, Carlisle, and other “civilized” parts of Pennsylvania. 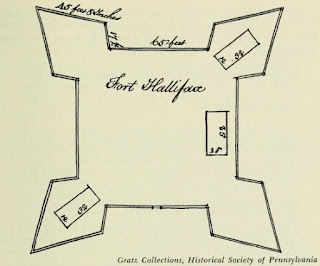 Locally, residents of Paxton Township began construction of a fortified structure at Hunter’s Mill, later to be known as Fort Hunter, and John Harris stockaded and strengthened his house at Harris’s Ferry in anticipation of trouble with the Indians. Continued attacks in the winter and spring of 1756 led the government to approve the construction of a line of forts and stockades running from the Pocono Mountains southwest toward Pittsburgh along the frontier. Clapham and most of the regiment continued on to Shamokin leaving Captain Nathaniel Miles and 30 men to complete barracks, a storehouse, and shooting platforms in the bastions. The fort was named by the Governor in honor of the Earl of Halifax. For the next year, the fort was garrisoned by approximately 30 men and served as a supply depot for the movement of food, equipment, and other supplies to Fort Augusta. However, in the fall of 1757, Fort Halifax was deemed to be obsolete and it was abandoned in favor of Fort Hunter. Although it was only used for a short period of time, Fort Halifax would have had many people passing through on military business and thus has the opportunity for important information to be recovered from this site. The exact location of the fort has been sought for years with little luck. Several archaeological investigations have been conducted to locate the fortifications and determine the construction methods as well as to identify archaeological evidence of the soldier’s daily lives. Investigations were conducted from 2011 through 2013 by PennDOT, metal detecting in 2015, and additional fieldwork was performed for a master’s thesis. Investigative measures included surface collection, ground penetrating radar (GPR), excavation, mechanical stripping, metal detecting, archival research, and geomorphology. Although these were all unsuccessful in locating the physical remains of the fort, many artifacts were recovered that point to the site of the fort being close by. A variety of gunflints and musket balls of various sizes were found, indicating the possibility of military activity in the vicinity. Lead musket balls were used in muskets, a smoothbore gun popular in the eighteenth century, and came in different sizes. 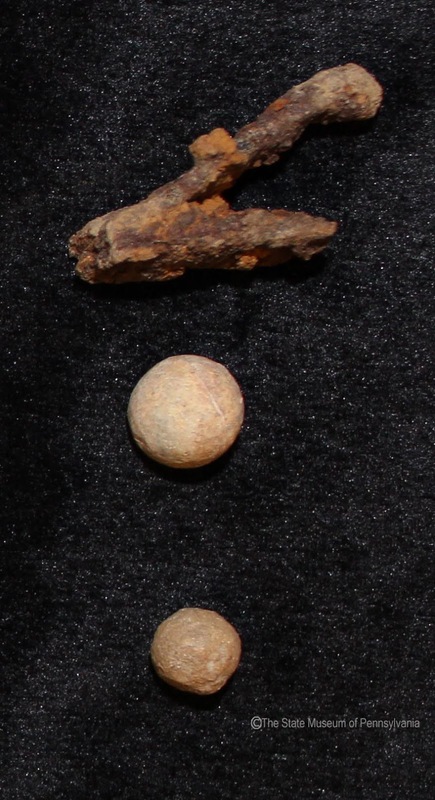 The musket balls in the photo below are .72 cal., .61 cal., .53 cal., and .39 cal. as well as two lead sprue or disfigured balls that may have been fired. In addition, a square grey, English gunflint was recovered. Clothing fasteners such as buttons and buckles were also recovered from these excavations. The men garrisoning this fort would likely not have been issued British uniforms, instead wearing a jacket or linen smock (long overshirt), breeches or trousers, a waistcoat, shirt, leather shoes, stock or cravat at the neck, and a hat – clothes they would have had at home. These items of clothing generally fastened with or were decorated with buckles and buttons of various materials such as brass, wood, bone, and pewter. 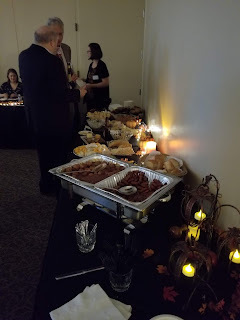 The men would have been fed with supplies provided by the Colonial government, usually consisting of fresh or dried meat, Indian corn, bread or biscuits, and a daily ration of rum. Tableware was not standardized and would have consisted of whatever was available, possibly some of it brought along with the soldiers. Many types of ceramics that would have been common at the time were found at Fort Halifax. The soldiers would also have carried personal items with them to the fort, including things like combs, mirrors, pocket watches, coins, rings and jewelry, smoking pipes, and musical instruments. 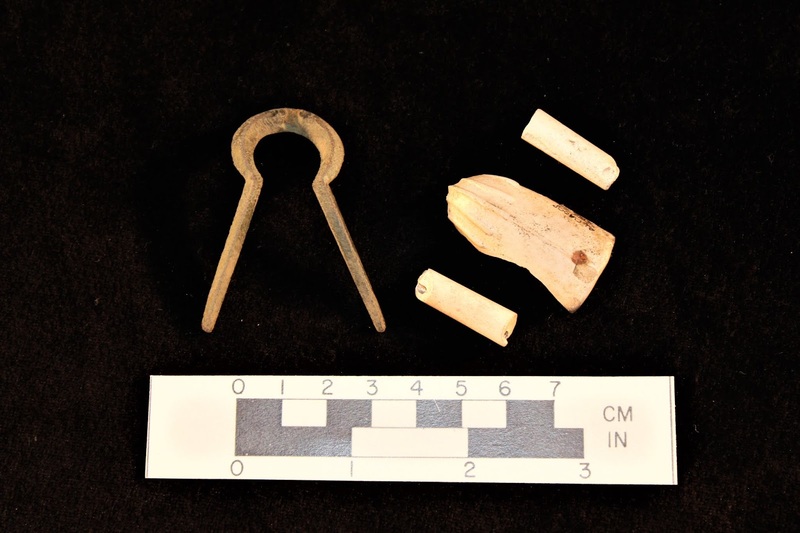 Two personal items that were recovered from the Fort Halifax excavations included pieces of a kaolin clay smoking pipe and a Jew’s or mouth harp. Clay smoking pipes were very common and were easily breakable and so are found on virtually all sites of this time period. The brass Jew’s harp was a small musical instrument, played by placing it to the lips and “plucking” the metal tongue (missing on this example). These are just some of the artifacts recovered from the excavations at Fort Halifax. And although the physical fort has not yet been found, artifacts recovered from investigations of the area indicate that archaeologists are likely in the close vicinity of the former structure. The collection, although small, is important for its research potential. 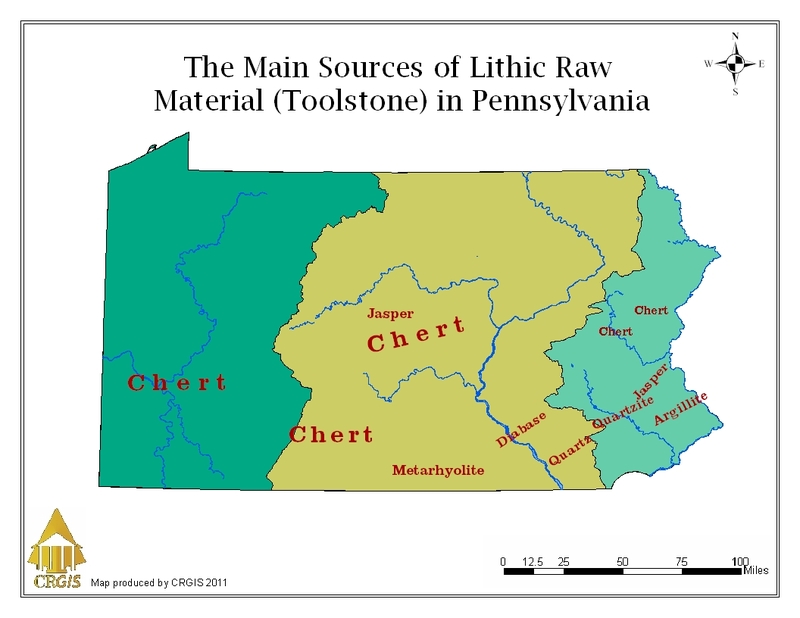 Artifacts are similar to those in collections from other forts, such as Fort Hunter, and add to the collective information on Pennsylvania forts of the French and Indian War period. 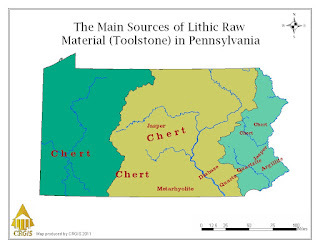 Continuing research into the location of the fort and study of its artifact collections should help in its eventual discovery and add to the overall knowledge of Pennsylvania fort sites. We at the Section of Archaeology wish everyone a terrific Holiday season! We hope to see you all at the Section of Archaeology exhibit at the 2019 Pennsylvania State Farm Show, January 5th – 12th. Archaeological Survey Team. Submitted to Pennsylvania Historic Museum Commission. 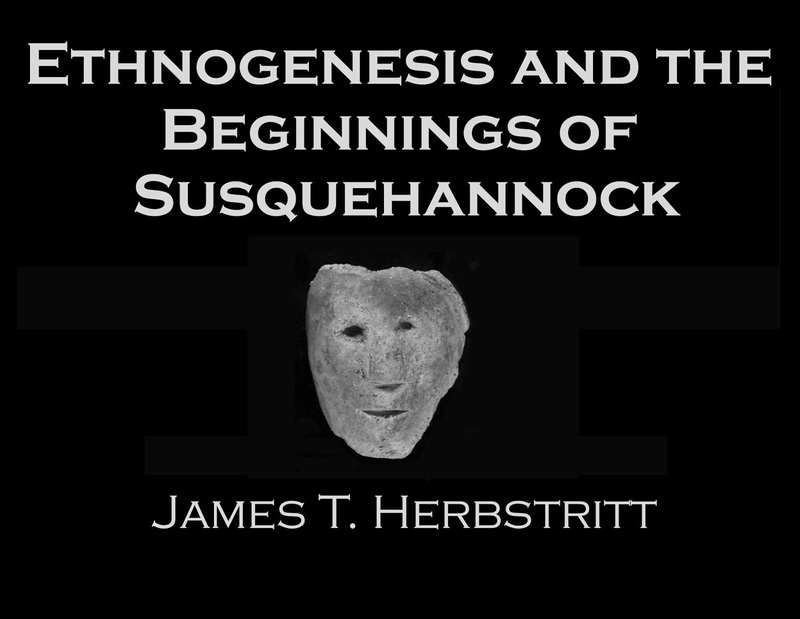 Copies available from PennDOT Highway Archaeological Survey Team, Indiana. 1851 Minutes of the Provincial Council of Pennsylvania, Vol. 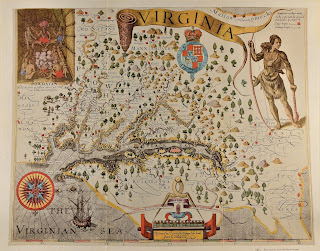 6, April 2, 1754, to January 29th, 1756. Harrisburg: Theo. Fenn & Co.
1851 Minutes of the Provincial Council of Pennsylvania, Vol. 7, January 28th, 1756, to January 11th, 1758. Harrisburg: Theo. Fenn & Co.
of the Secretary of Commerce, Conformably to the Acts of the General Assembly, February 15, 1851 & March 1, 1852., Volume II. Joseph Severns & Co, Philadelphia. 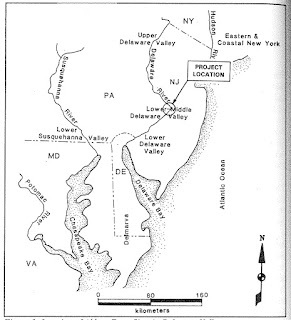 1960 Forts on the Pennsylvania Frontier, 1753-1758. The Pennsylvania Historical and Museum Commission, Harrisburg, PA. The radio stations are playing Christmas music, everyone is looking for the best deal on that perfect gift and we know the Christmas season has begun. 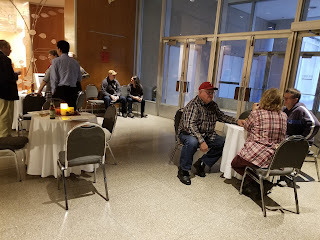 Here in the Section of Archaeology the Christmas season has an added meaning; the Pennsylvania State Farm Show will begin soon, and preparations must be underway. Although we are in Farm Show preparation mode right now, the lab archaeologists and cherished volunteers have also been hard at work processing the artifacts found at Fort Hunter this past field season. Other posts to this blog have discussed what “processing artifacts” entails and the steps taken to curate artifacts for long term stability. In this blog we are going to take a brief look at where we are at in this process with the 2018 Fort Hunter field season artifacts. As previously mentioned in this blog, a general rule of thumb for the time it will take to fully process artifacts in the lab is approximately seven days of lab work to each day of field work, depending on the quantity and types of artifacts found. Thankfully we have a group of dedicated and diligent volunteers who, as always, have cut down this processing time for us. We are expecting our lab processing time to be reduced a little more due to the high number of rain days we had during the Fort Hunter field season this year and we anticipate processing will be completed a little sooner this year. 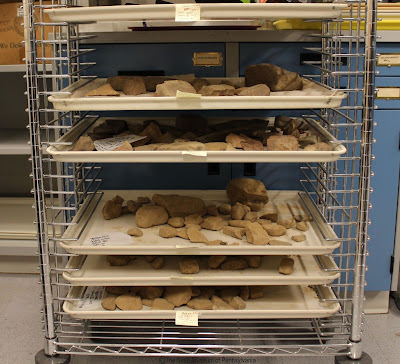 Currently, nearly all the artifacts have been washed and labeled, leaving only a few trays of fire cracked rock left to go through these steps. Once the artifacts are washed and labeled it is up to the lab archaeologists to identify the artifacts, bag them for permanent curation, and inventory them. Artifact identification often requires research of the object to properly identify and to determine a suggested period of manufacture of use. 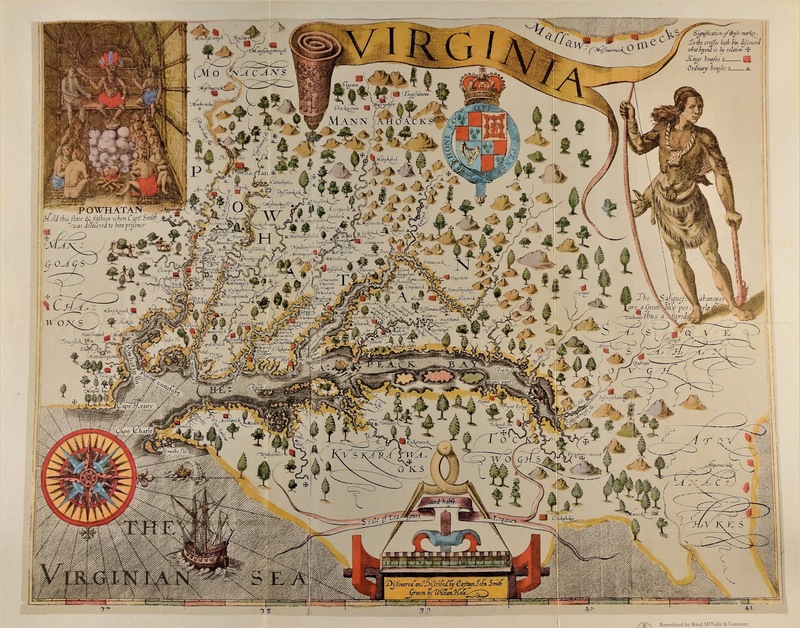 We rely heavily on the expertise of staff and trusted published resources such as Ivor Noel Hume’s, A Guide to Artifacts of Colonial America. Much of the current work with the 2018 Fort Hunter artifacts is in this step of artifact identification and bagging. (For more information on how artifacts are processed in the state museum archaeology lab check out our previous blog, Behind the Scenes at The State Museum—Processing the Fort Hunter Collection What happens after the field work is done?). A little over half of the artifacts have been identified and bagged and an inventory is underway. In the past few years we have had artifact counts between 13,100 and 10,500 and with these artifacts counts it is normally early January when we get to this point, which makes us believe far fewer artifacts were collected this year. As we have not made it to the inventory step in our process we cannot say for certain if we have fewer artifacts. It is with the information we gather from the inventory that we can compare what has been collected this year to those of previous years. With the detailed artifact information recorded in the inventory database we can conduct analysis to identify patterns of types of artifacts found and where they are being found. With this data we can create distribution maps, which helps us to identify areas of interest and the potential location of the fort, our ultimate goal. So here we are, moving right along with the curating the Fort Hunter artifacts, nearly halfway done and doing it a little more quickly than in previous years. As we process the artifacts, it becomes more clear what types of artifacts are present in the collection and this year we have a few more to help tell the story of the Fort Hunter Mansion and Park historic landscape. Tin-glazed earthenware fragments, in production from the early seventeenth century through the mid-eighteenth century. White salt-glazed scratch-blue stoneware fragments, in production from the mid to late-eighteenth century. Gun lock spring fragment and lead musket balls, eighteenth century. Kaolin pipe stems and pipe bowl fragments, dating to the mid-eighteenth century. Straight pins, most likely dating to the eighteenth century. Crucible fragments, our mystery, as the source for these artifacts is currently unknown based on historical documentation (For more information on crucibles found at Fort Hunter visit our previous blog To Be Ore Not To Be: Crucibles are the Answer). Button with faded starburst pattern. 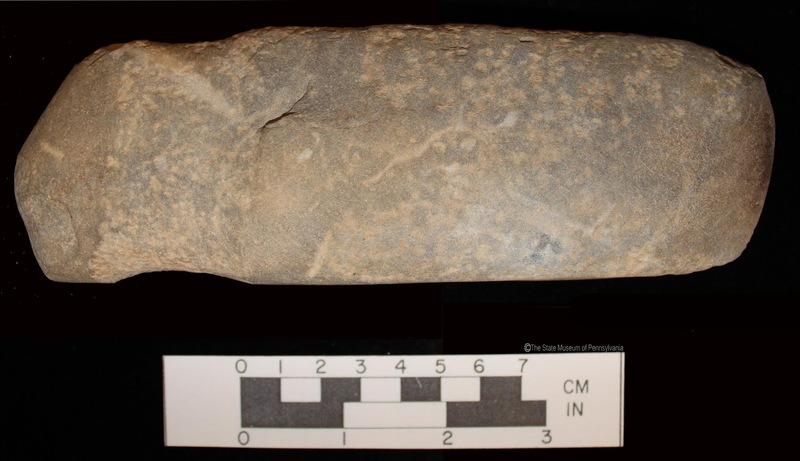 A full grooved stone axe discovered in situ, estimated to be around 4,000 years old. 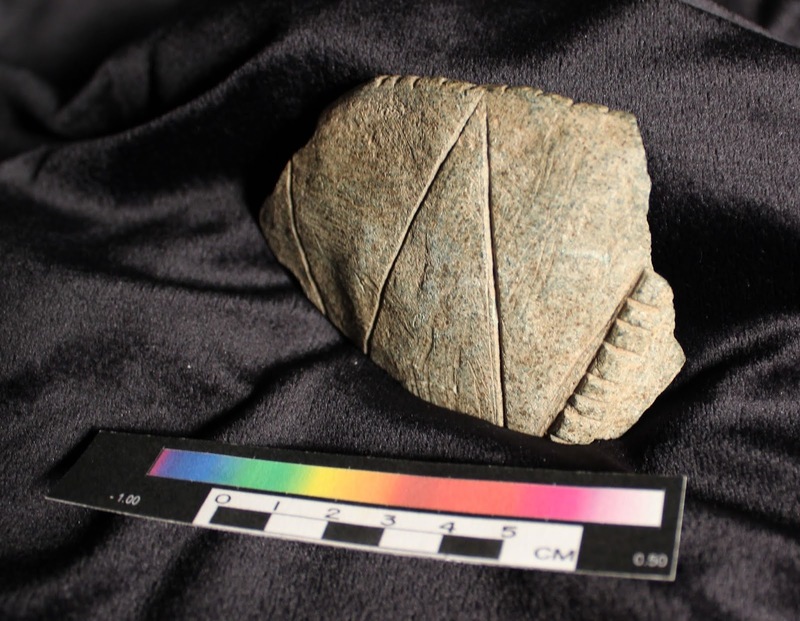 We hope you have enjoyed this update on what is happening to the artifacts found at Fort Hunter during the 2018 field season and we wish you all a wonderful and safe holiday season! See you at the 2019 Pennsylvania State Farm Show, January 5th-12th. 1970 A Guide to Artifacts of Colonial America. Alfred A. Knopf, Inc., New York. 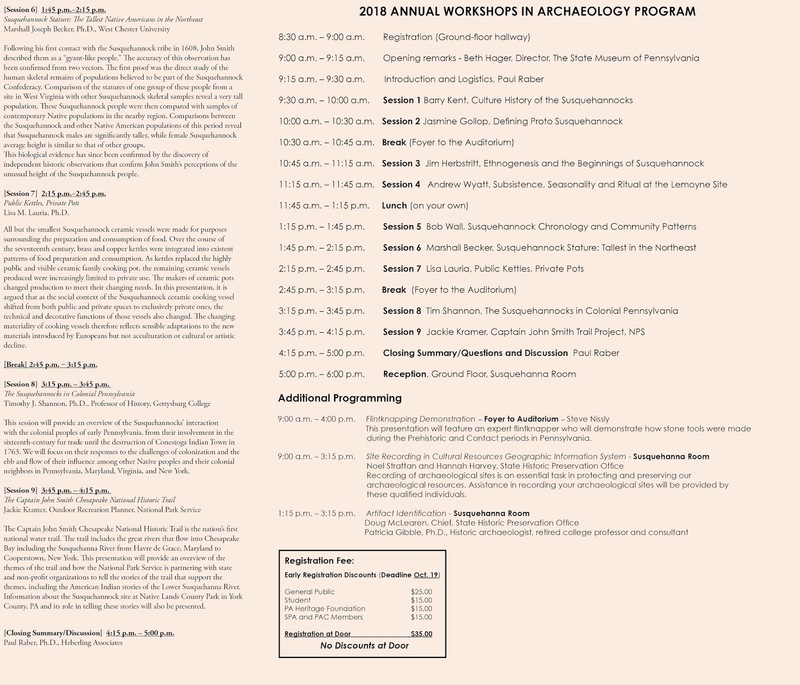 Registration for this year’s Workshops in Archaeology program is proving to be one of our largest presentations to the public since the 1990’s! 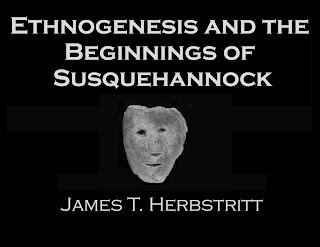 Through current and ongoing research, archaeologists and historians from the Northeast and Middle Atlantic regions will trace the path of the Susquehannocks from their ancestral homelands in northern Pennsylvania to their violent disappearance in the lower Susquehanna Valley in 1763. Please join us at the State Museum of Pennsylvania on October 27th to learn about this most fascinating topic. The 2018 field season at Fort Hunter Mansion & Park is coming to a close soon and it has been a wet one! Last year we marveled at not having a single rain day, this year is quite the opposite. It has been a terrific year for visitors, the press, social media and just general interest in our excavation. Fort Hunter Day was one of those rare beautiful days when everyone was eager to get outside and enjoy the sunshine as demonstrated by the more than 3,000 visitors at the site. We welcome everyone to visit and observe our excavation but especially, to ask questions. Some of our visitors have been following us and our progress every September and early October since 2006 so they know the routine. Others are visiting for the first time and are new to the archaeological process. Most of our visitors stand off to the side, a little unsure whether to come closer. 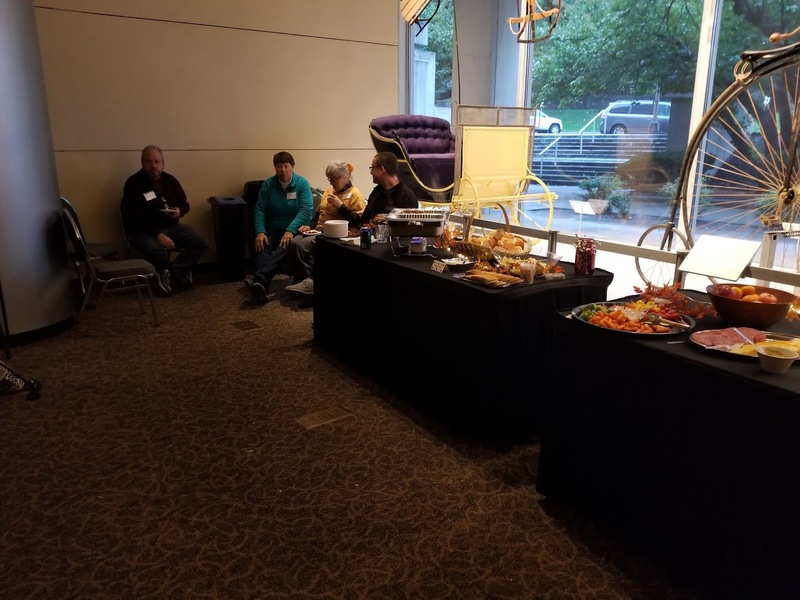 Once they see that we’re just harmless, crazy archaeologists, the exchanges between visitors and staff demonstrate that there is an increasing interest in archaeology and our heritage in central Pennsylvania. As with any job, once you have done something for a while you take for granted the process and begin to overlook some of the minutia of the task. You complete the process without really thinking about how or why you do things a certain way. For an individual who has never visited an archaeological site or had an opportunity to observe the process, it can be confusing and perhaps a bit overwhelming. 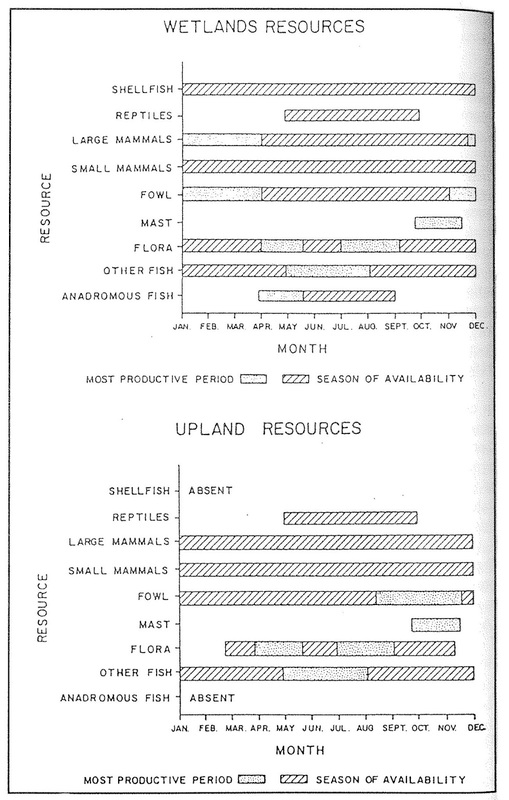 This is the challenge of public archaeology; make it understandable and relative to the general public. So, some of the questions that our visitors ask may seem insignificant to us but are obviously important to their understanding of archaeology. This blog will address some of the questions we’ve received and hopefully some of our followers have had these or similar questions of their own that will be answered. PHMC archaeologist Janet Johnson speaks with visitors to the site during Fort Hunter Day. Probably the most common question- what are you looking for? Our immediate response is something to the effect of “We’re archaeologists with The State Museum of Pennsylvania and are looking for evidence of the French & Indian War period fort that stood here between 1755 and 1763.” It’s true we began this project in 2006 with hopes of finding a stockade trench and a blockhouse described in historic documents. 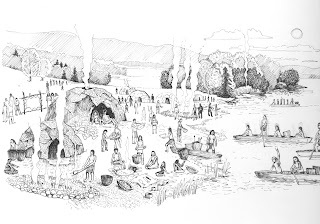 However, while this was and is our ideal, the search goes far beyond the French and Indian War period. Fort Hunter Mansion and Park has been used for thousands of years and we are literally peeling back the soil to discover the lives of the Indians, colonists, industrialist, farmer and businessman who left their trace. Why are you digging here? The initial area of excavation was prompted by ground penetrating radar that indicated areas of ground disturbance that seemed most promising. The discovery of a feature interpreted as the bake oven in 2006 was facilitated by that technology. Subsequent investigations were based on soil changes and trenching that provided a window into activity areas for which we later explored. Our investigation is also guided by the archaeological evidence recovered in previous excavations, the artifacts and features. Artifacts are the tangible evidence of the past- their presence in undisturbed soils, as identified stratigraphically, is priceless. 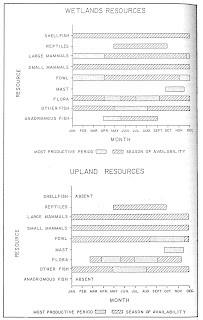 So when asked, “Why don’t you dig down on the bank, closer to the river and Fishing Creek?” the answer is all about the stratigraphy and that undisturbed soil. 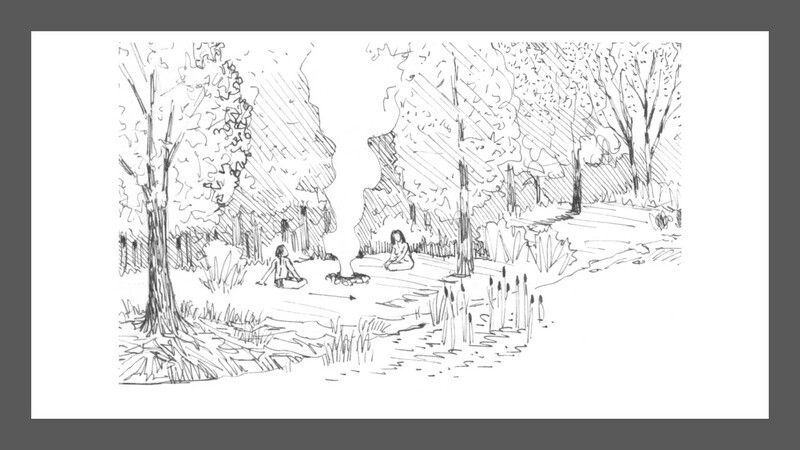 As stated earlier, lots of people have lived on this piece of ground and all of them have dug in the dirt, had campfires, disturbed soils and left their “mark” or presence on the landscape. It is all this activity that is challenging to sort through and identify the intact soils and the undisturbed stratigraphy. This year, we have uncovered an undisturbed living floor that dates to the Woodland period, 1000- 2900 years ago. Significant not only for its integrity as an intact soil package but also for the picture of the past provided. 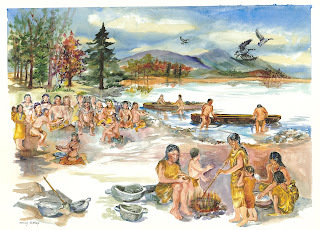 Envision Indians sitting around a campfire cooking fish or game recently caught while they sharpen their projectile points (arrowheads) and polish a stone axe. Our evidence of this picture comes in the form of lithic flakes, fire-cracked rock, broken pottery and a stone axe- tangible evidence of the past. 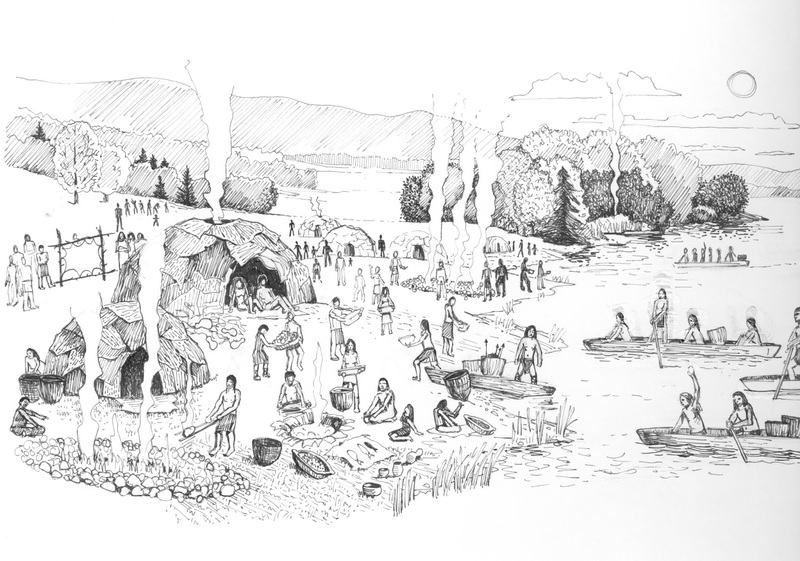 This drawing depicts indigenous people sitting by a camp fire. Another frequently asked question “What are those colored pins in the ground- the red and blue things?” The soil markers designate stratigraphy- soil layers- within our excavation unit. Red pins define natural soil changes while the blue pins designate incremental soil levels of .25/10ths or 3 inches. Archaeology is a destructive process and it is only through careful excavation that we can examine the soils and identify anomalies we refer to as features. Features are activities that leave evidence in the soil- a cooking hearth is a feature identified by charcoal flecks and fire cracked and reddened rocks. What happens to the dirt that you dig out? Dirt is screened through quarter inch mesh to identify artifacts that may have not been recovered during excavation. This process can be time consuming but is so very important to ensure that we don’t overlook artifacts or indicators of activities. The backdirt piles (sifted soil piles under the screen) are eventually used by the grounds crew at Fort Hunter to fill in the excavation units. Staff and volunteers screen dirt through 1/4" wire mesh at Fort Hunter. What happens when you stop digging for this year? The units (5x5 square) that we have opened are covered over with a heavy black plastic. The grounds crew at Fort Hunter will use soil from the back dirt pile to fill in the open units and the black plastic is a marker for us should we wish to return to a unit the following year. Where do the artifacts go? 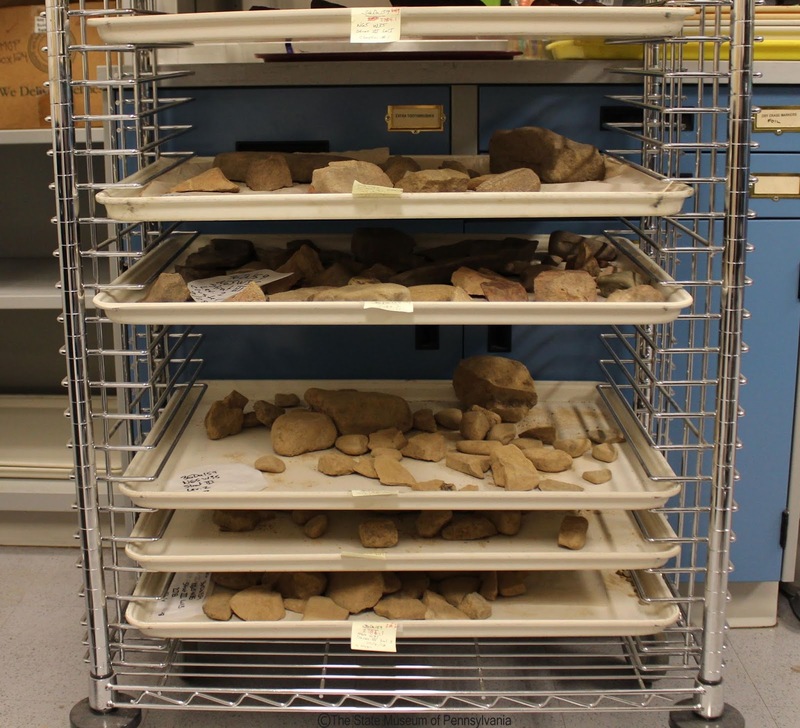 The artifacts go to the archaeology lab of the State Museum for processing which involves washing, labeling, and identification. Research and analysis of all the artifacts is conducted over the winter and spring prior to permanent curation. 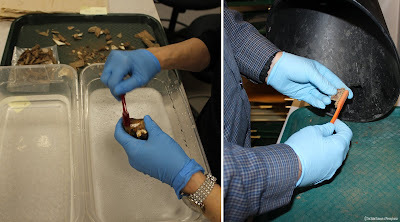 Conservation treatment is preserved on the most fragile or corroded of the artifacts. Specialized treatment aids in the preservation of these artifacts and ensures stability for many years to come. This record-breaking year of wet weather has taken a toll on excavations and a frequent question has to do with how we deal with bad weather. We are able to continue excavations if the rain is light, but any periods longer than a few minutes create a muddy mess that is more likely to damage features. We screen the soil in our buckets, bag any artifacts and cover the units with plastic to preserve the exposed floor. The next day we bail out water from the top of the plastic and then carefully remove the plastic to see if we were successful in our endeavors to save the units from damage. Water from overnight rain sits atop the black plastic used to cover excavation units. What have you found? What’s the most interesting thing you’ve found here? We have found many artifacts that represent the activities of Fort Hunter and several of them provide interesting stories of the residents of this site. No one object tells the story of Fort Hunter so there is not an easy answer as to the most interesting or important artifact. This year’s recovery of a stone axe will be a highlight since these are rare discoveries during excavation. 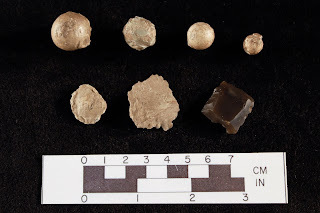 The volume of musket balls and swan shot are of particular interest and further analysis will look for density of these materials this year as compared to other years and locations. A full grooved stone axe recovered during 2018 excavations at Fort Hunter. This historic reference to supplies issued in December of 1755 references Swan Shot and the delivery of twenty-five pounds to the site. There are spent (used) and unused shot present in the excavations adjacent to the summer kitchen at the rear of the mansion. Further investigation of the linear feature is necessary to understand it’s use and time period of construction, but for now we are happy to explore the possibility that this may be a portion of the ditch referenced above. We only have a week left for the 2018 field season; our last day is October 5th . With a forecast of a dry weekend we can only hope that the trend will continue into next week and we’ll be able to explore these questions and others before the plastic goes on and we let the site rest until next September. 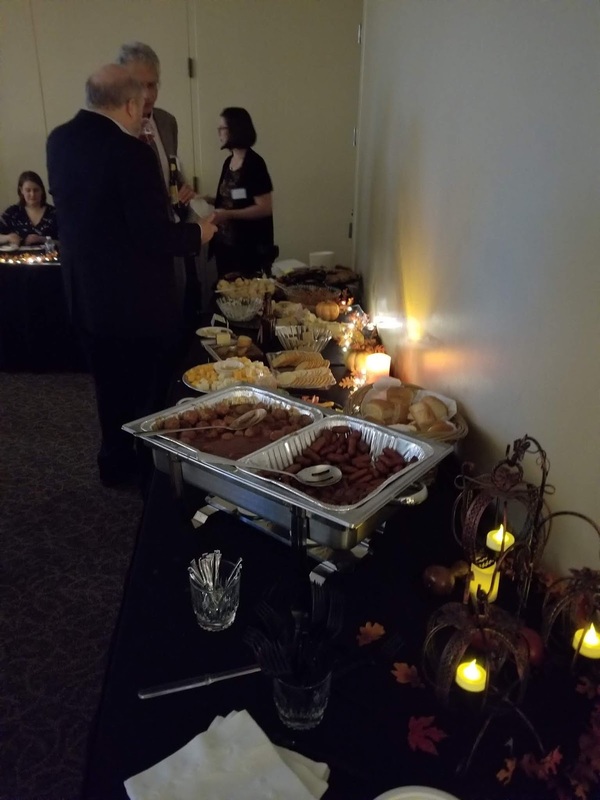 We hope you will find the time to visit us and observe the process of discovering the archaeological heritage of Fort Hunter Mansion & Park, Dauphin County. We encourage you to continue to check the blog for updates on the analysis of the artifacts and data throughout the winter months as we explore the story of this important site. One last question that visitors ask- What are your jobs or tasks when you go back to the office? The analysis and processing of the artifacts is only a portion of our jobs as we curate over 9 million artifacts from across the Commonwealth. We also conduct a major outreach program at the Pennsylvania Farm Show in January. 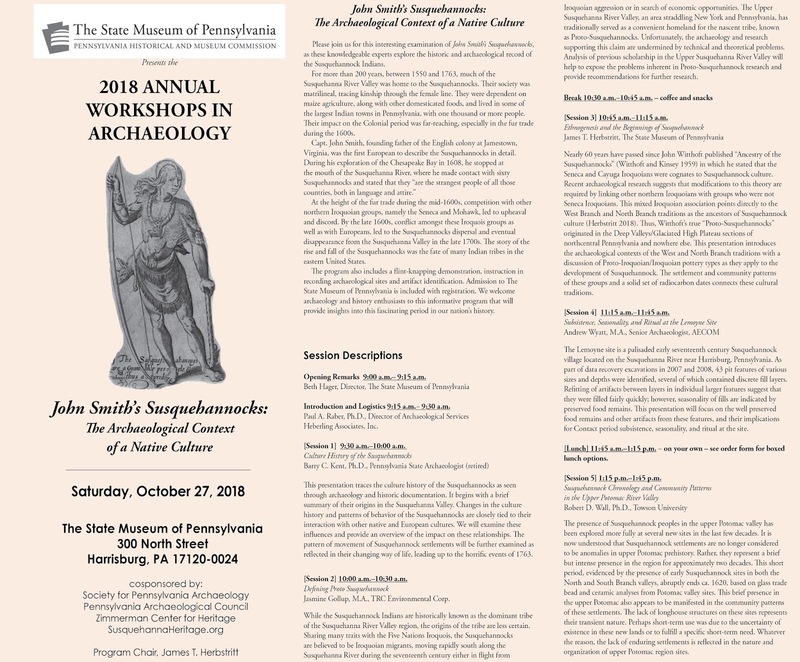 There is an exhibit to design, brochure to develop and print and labels to prepare for artifacts on display during this event. 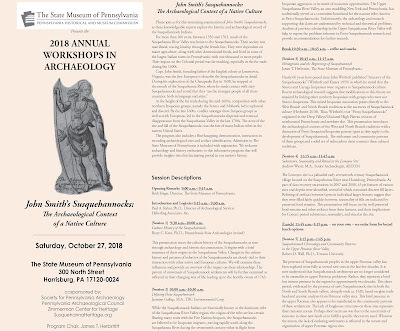 Our most immediate attention will focus on preparing for the Workshops in Archaeology program on October 27th. 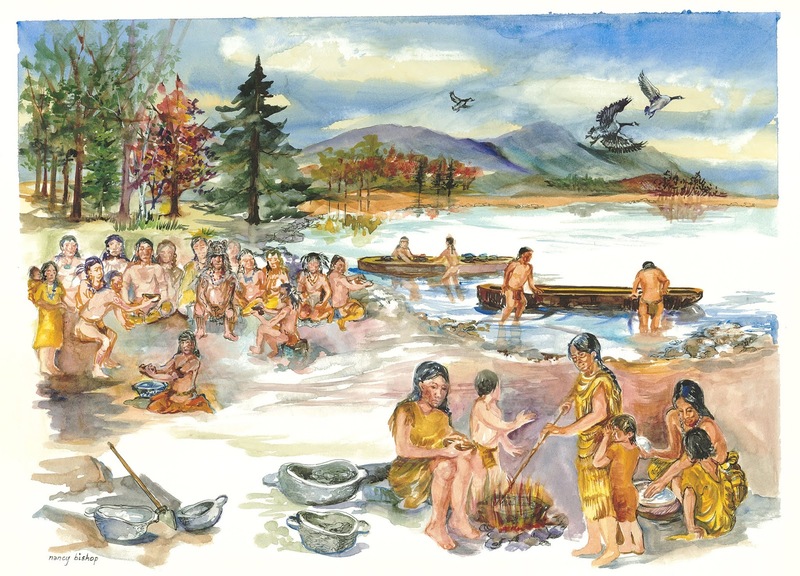 This one day event will focus on the Susquehannock Indians who lived along the river and interacted with Captain John Smith in the Chesapeake Bay in 1608. The story of their tribe as seen from an archaeological perspective and through their artifacts is fascinating. 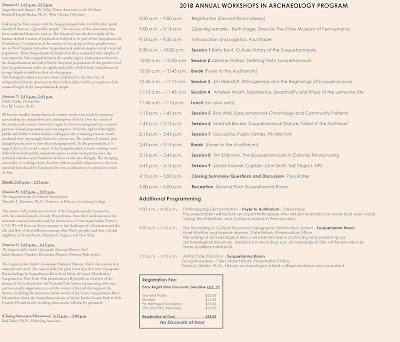 We invite you to check out the registration information and program information for 2018 Workshops in Archaeology. It’s not raining today and we have school groups scheduled so it’s time to dig! Hopefully you’ll stop by to see our progress and ask a few of your own questions.